This Memorial Day weekend we're devoting Dog Song Saturday here at Talking Dogs to all of the amazing dogs who have stood by our soldiers for decades. Today we honor Military K-9s and, of course, also remember the people who have died while service in our country's armed forces. The music video was put together by From the Heart Rescue and is accompanied by Some Gave All sung by Billy Ray Cyrus. ‎1914–1918: Dogs were used by international forces to deliver vital messages. About a million dogs died in action. Sgt Stubby, an American Pit Bull Terrier mix was the most awarded dog of World War I and became the first dog to be given a rank (of Sergeant) when he discovered and alerted the Allies to the presence of a German spy. 1943–1945: The Marine Corps used dogs, donated by owners, in the Pacific theater to help take islands back from the Japanese. The Doberman became the official dog of the USMC; however, all breeds of dogs were eligible to train to be "war dogs". At the height of WWII more than 10,000 dogs from the United States were in action. Of the 549 dogs that returned from the war, only 4 could not be returned to civilian life. Many of the dogs went home with their handlers from the war. 1966–1973: Approximately 5,000 US war dogs served in the Vietnam War (the US Army did not retain records prior to 1968); about 10,000 US servicemen served as dog-handlers during the war, and the K9 units are estimated to have saved over 10,000 human lives. 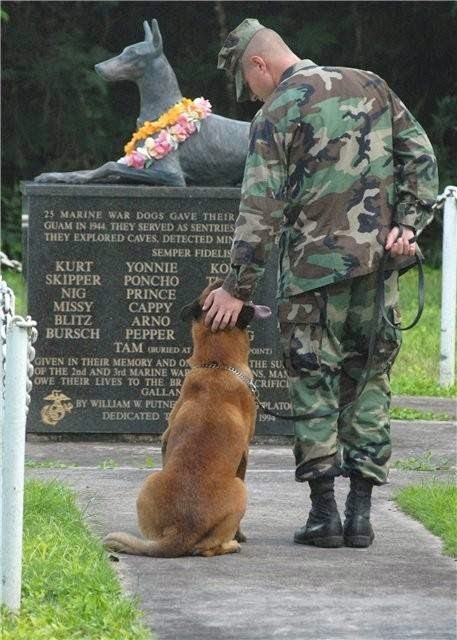 232 military working dogs and 295 servicemen/dog handlers were killed in action. It is estimated about 200 Vietnam War dogs survived the war to be assigned at other US bases outside the US; the remaining dogs were euthanized or left behind. Sit. Stay. Take a moment to reflect on these remarkable dogs and have a barking good Memorial Day holiday weekend. Fetch more dog songs and music videos at Talking Dogs. You'll be surprised at how many we've collected over the years. Thank you for this, god bless those military dogs and their handlers. Have a wonderful Memorial Day.